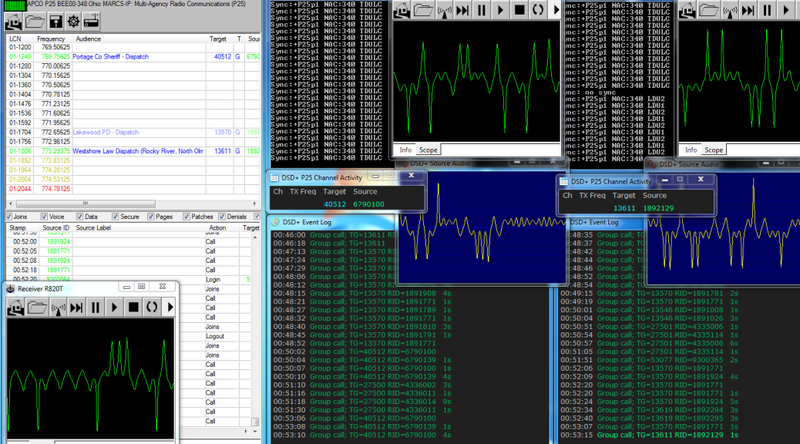 Unitrunker has common functionality of many scanner receivers. You can set the priority of the voice calls and lockout ones you don’t want to hear. Depending on the system you’re listening to, you may notice agencies nowhere near your location. This depends on the coverage area of the system. Unitrunker downloads the entire system because it has no way of knowing which agencies primarily use the site you’re listening to. 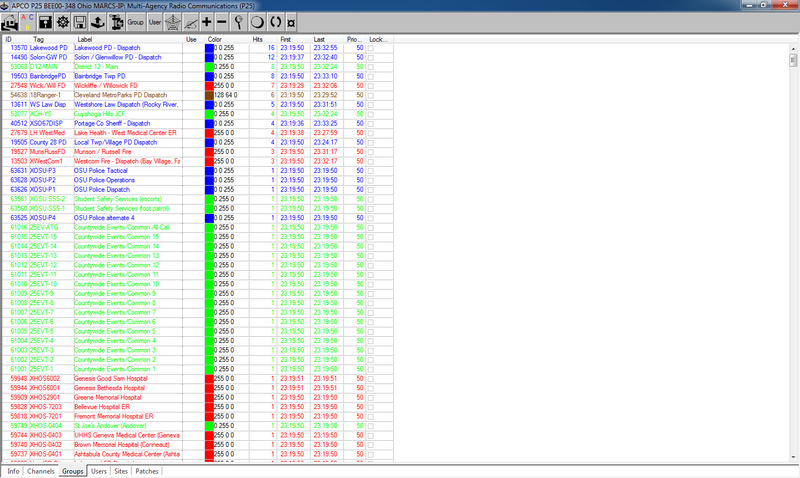 The list can be sorted by the column headings. This is sorted by hits. By default, all talk groups are set to a priority of 50. Double-click a group you want to edit. Under Listen is Priority and Lockout. If you are interested and want to hear more calls from this talkgroup/agency, give it a higher priority number or a lesser priority number if you don’t want to hear them as often. Unitrunker is tuned to talkgroup 321 with a priority of 20. A new call comes from talkgroup 678 and it too has a priority of 20. Unitrunker will stay on talkgroup 321 until it completes. If 678 is still in their call, Unitrunker will then switch to talkgroup 678. If 321 starts a new call, it will wait until 678 is done with their call and switch back to 321 because they have the same priority number. First in, first out. Unitrunker is tuned to talkgroup 445 with a default priority of 50. A new call comes from talkgroup 887 and has a priority of 10. Unitrunker will switch away from talkgroup 445 and tune in talkgroup 887 until the call completes because 887 has a higher priority. When 887 completes, if 445 is still in a call, Unitrunker will then switch back to talkgroup 445. If 887 starts a new call, it will again switch away from 445. Check Lockout if you want Unitrunker to ignore the talkgroup all-together. It will still show on screen but the voice tuners will not tune it in. Affiliation happens when a radio on the system associates with that talk group. Playing an audio file every time this happens will get annoying. Call is any routine transmission. 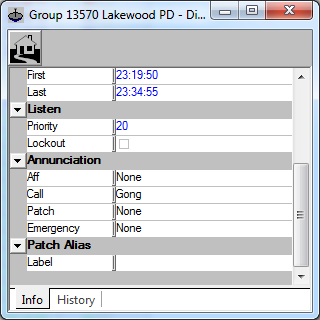 Patch happens when one agency needs to convey information to another agency. They will “link” the two or more talkgroups together. Only groups on the same system can be linked. Emergency sends a tone to all radios on the talkgroup (like officer down). Missed and garbled calls are because of errors in receiving or decoding the frequency a talk group is using. These are shown in the DSDPlus main window next to the logical data units (LDU1/2) with an “e:.” Sometimes issues are a result of atmospheric conditions (band openings, wind). Reception of the control channel is strong (doesn’t fade). Unitrunker has a green strength indicator in the site window or check the Signal device properties Health indication. No indication means reception is non-existent (wrong control channel, no control channel, out of range) or the software lost communication with the RTL-SDR dongle (USB, USB hub, cable issue). If no frequencies are being highlighted in green in Unitrunker when voice calls are coming in, the Voice receiver is stopped, not configured for P25 in the devices properties, or listen is not checked in the Unitrunker options. PPM correction. Try the Drift Correct option in the receiver. Both in the receivers properties. Change the Auto Gain setting and gain number. Both in the receivers properties. Playback and Recording Sound settings. 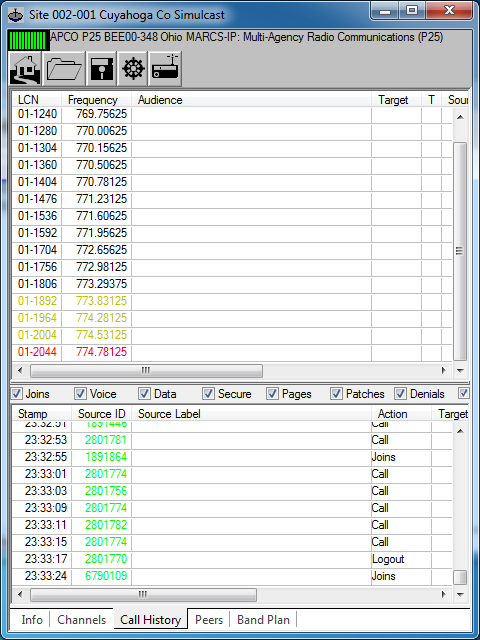 When the voice receiver is tuned, green should fill in the Line 1 UV meter on both tabs. The P25 modulation is constant and the green level should be as well and fluctuate little to none. Check the sample rate is at least 48000 Hz . Check this in the VAC Control Panel too. Start DSDPlus by itself and check playback and recording device numbers. Verify in these in the batch file. These will change if sound devices are added, removed, or defaults are changed. Receiving with no antenna connected. Receiving with a paper clip plugged into the center of the MCX connector. Use the supplied antenna that came with the dongle. A rubber-duck (HT type) antenna. An external and/or directional antenna. After you’ve downloaded the site, you notice something is wrong. Most likely a label for a talk group. First update the system with the Download this site option. It will download from Radio Reference again. If there are changes a separate box will appear with changes. Hit Accept All Changes. If the information is still wrong, check for threads on this system usually in the state section of the Radio Reference forums. Finally, go back to the system information page in the Radio Reference database. Click Submit and follow the instructions. The best place I can recommend to go is the Radio Reference forums. This is the best place to find other enthusiasts and even the program developers. Locals (who know the systems) can help you out with specific questions and issues. Follow the rules to post in the right area, don’t be a jag, and do some research first.